Men's fabric belts are the perfect finish to any casual outfit since they come in a wide range of styles and colors. Belts are one accessory that many men cannot live without. They serve two purposes: to hold up your pants and to add a stylish touch to your waistline. Belts come in endless styles, from a simple leather strap belt to a funky-colored fabric belt, and everything in between. For the man who wants a break from the traditional leather belt, which is sometimes uncomfortable, consider a fabric belt. They are a great, casual addition to many outfits. They can be found in an array of colors such as black, brown, navy and green as well as in seasonal colors such as white. Some fabric belts are done in bold colors like red or in a stripe pattern that features several color combinations. To find a fabric belt, check local department stores in the men's accessory department for the latest styles. Many men's stores also carry a selection of belts on their racks as well. Of course, there are endless online options to explore as well. Once you have decided to add a fabric belt to your wardrobe, deciding what style you want is the next step. Belts may be done in a classic style that can be worn year-round or in a trendy style that matches the season. A timeless choice is the World's Most Comfortable Belt found at Orvis. It is done in a woven stretch cotton and elastic blend and has a solid brass buckle and dark brown leather tabs. It comes in black, olive and rust and in sizes 32-46. Another classic belt is the Dockers Braid Belt. This belt comes in cream. It is 1.4 inches wide and made of 100% cotton. It has an antique silver and leather buckle. For an edgy accent, try the Braided Cotton Belt from J. Crew. It is done with a silver buckle and leather accents, and comes in light hickory. The ultimate in casual is Fossil's Kyle Belt. Made of woven fabric and leather trim, this belt also has a unique light/dark color contrast. If you are looking for a striped fabric belt, check out one of Gucci's signature belts done with green and red stripes and accented by a buckle featuring the popular double G logo. 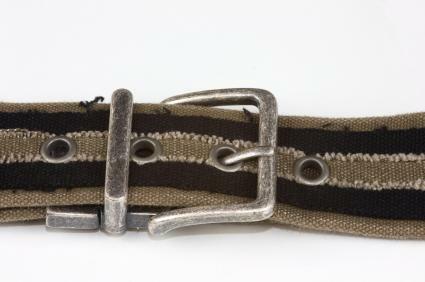 This belt comes in several variations including white, brown, light tan, and grey. Men's fabric belts look great with a range of casual apparel but should not be worn for professional or formal occasions. They are not the best choice for suits or dress slacks and should be saved for less formal pants. Wear them with jeans, cargos or khakis. They even look great with a pair of shorts. Be sure to get a color that matches your pants or adds a pop of color to whatever you are wearing.